Summary: Hinduism is unlike any other religion because of the circumstances in which it emerged as a major world religion. In this essay we trace the historical origin of the words Hindu and Hinduism and how they acquired religious connotations overtime. Until recently, people outside India had many misconceptions about Hinduism. Many were not even aware that it was a major world religion and the old continuing religious tradition. Even today, a number of people in the western world do not know much about it or have vague knowledge of it. Hinduism is the oldest living religion of the world and the third largest. It is practiced by over a billion people in the world. It has a close affinity with Jainism, Buddhism, Sikhism and in some respects with Zoroastrianism. In this essay we will examine what Hinduism means and how it is different from other world religions. Surprisingly, although Hinduism is a very ancient religious tradition, the word "Hinduism," which today defines it and distinguishes it from the rest of the world religions, is of much later origin. In ancient India there were no Hindus. You had either a Brahmana, Pandita, Somayaji, Agnihotri, Smarta, Yogi, Jogi, Acharya, bhakta, tantric, sanyasi, samkhya-vadin, Vedantin, Mimansaka, Vaisheshika, Jina, Charvaka, Lokayata, Ajivika, rishi, muni, yogini, devi, Swami, Shiava, Vaishnava, Siddha, Buddha and so on, but no Hindu. People belonged to numerous religious sects, ascetic groups, teacher traditions, and schools of philosophy, most of which subsequently became part of Hinduism due to historic reasons. The name Hinduism came into existence out of expediency to distinguish the native religious traditions of India from those which were practiced outside. Somehow the name stuck, much to the discontent of many modern Hindus who consider it a legacy of India’s colonialism and foreign subjugation. However, some scholars tend to argue that although the name Hinduism may be of recent origin, the native religious traditions of the Indian subcontinent which today go by the name Hinduism developed together in the same environment from the earliest times. They have a national aspect, a shared cultural identity and many common features, which are closely linked to the social, political and historic development of India, its ethos and people. Their essence is what we can consider Hinduism. We may therefore regard Hinduism as an ancient family of religious traditions that are distinctly Indian. Although the name Hinduism is a colonial construction, the essence of Hinduism is not a fiction or an artificial construct, but an indisputable reality. This argument is gaining ground among the new generation of Hindus, and in various forms, one of which is Hindutva. Interestingly the words "Hindu" and Hinduism are not Sanskrit words. No Hindu ever coined them. The Hindus were even unaware of such a terminology for a very long time. While the foreign scholars of Greece and Persia made an occasional glance out of curiosity towards the lands that existed beyond the Indus, the native Indians were busy in their own little world oblivious of the fact that they had very little in common with the outside world except perhaps in matters of commerce, governance and few other things. The earliest reference to the word "Hindu" can be found in the Avestha, the sacred book of the Zoroastrians. The word "Hindu 'ush" was also found at least in two inscriptions of king Darius (early sixth Century B.C. ), whose empire said to have extended up to the borders of the River Sindhu. Subsequently the word was picked up by Herodotus and later by the Armenians. For several centuries, the word was used to denote the people of the subcontinent, not people of a particular faith. From the eighth century A.D. onwards when the Muslims began to settle down in the Indus region they started using the word "Hindus" to distinguish the natives from the Muslims. Thus, we can see that the word Hindu was originally intended to refer to the native people of the Indian subcontinent rather than to their religious identity. 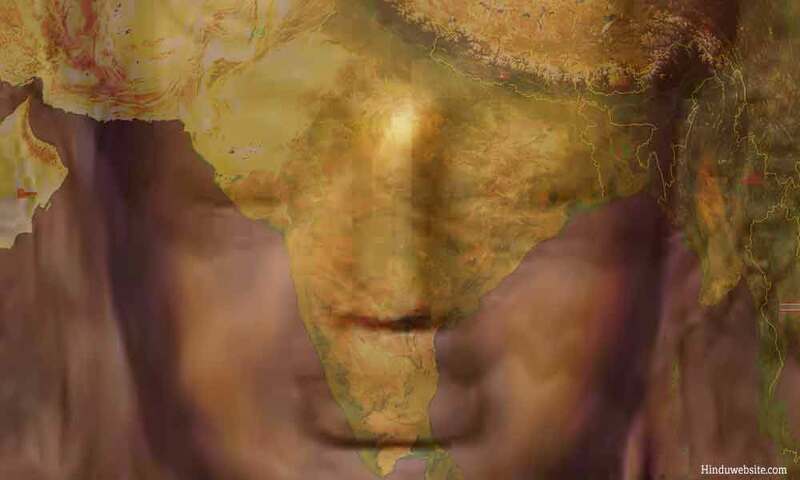 Hindustan was the land that existed beyond the River Indus, and those that lived there were referred to as Hindus. The word Hindu was originally a secular word meant to define and distinguish the people of the Indian subcontinent, rather than their religion. Accordingly, the land south of the Indus River became identified as Hindustan. If we go by the ancient traditions, there is hardly any difference between a Hindu and an Indian. Both the words were corrupt forms of the original Sanskrit word "Sindhu" meaning the river in general and the Indus River in particular. The Greeks referred to those living in the subcontinent as "Indos" while the Muslim scholars called them "Hindus." There was however one particular difference. The Greek historians who called the subcontinent as "Indos" hardly knew much about the religious beliefs and practices of the region, while the Muslim scholars had some knowledge of them. The Europeans who came to India from the sixteenth century onwards followed the same tradition and referred the natives as Hindus to distinguish them from the non-Muslims. The British, who were until then referring the natives variously as natives, baniyans, heathens, gentoos, etc., started referring all the non-Muslim natives as "Hindoos.” More than tradition, perhaps it was for convenience that they used the word to describe the non-Muslim population of India. Until then, the native people never identified themselves as Hindus. It is doubtful whether they were even aware of it. According to Gavin Flood, the word Hindu appears in the Sanskrit sources for the first time in the fifteenth century in Kashmir when the Shaiva historian Srivara used it to distinguish Muslims from Non-Muslims. It appeared in the Gaudiya Vaishnava texts in the sixteenth century to denote those who were not Yavanas or the Muslims. Among the scholars of the British period, Raja Rammohun Roy was the first India to use the word Hindu in his writings in 1816. It was only during the 18th and 19th centuries that Hindus started using the word to establish their national identity, oppose colonialism and imperialism and promote Indian nationalism. They also found in it a convenient solution not only to distinguish their faith from Islam and Christianity but also to counter and dispel any notion of superiority expressed or implied by the rival faiths. For the educated modern Hindu of that period the word was a very convenient way to establish his identity against the British as well as the native Muslims. For sometime the word "Hinduism" was used in a restricted sense, to designate the Vedic religion or Brahmanism. Nevertheless, with the emergence of new reform movements, which played a very crucial role in restructuring and redefining the social and religious traditions of the country, the word came to encompass the entire religious tradition that originated from the Vedas and continued through centuries. Today, although there is a lot of confusion among many foreign scholars about what constitutes Hinduism and what does not, there is no confusion among the native Indians about the identity or the faith of a Hindu. Many Hindus may not be able to define correctly Hinduism or explain what the word Hindu means, but they clearly know in their heart what they practice or represent. Without studying any religious texts or doing scholarly analysis, they can instantly recognize and accept fellow Hindus, even if they may not speak the same language or belong to the same region. The Hindu community is diverse. They belong to numerous national and ethnic identities, represent different countries and regions, speak different languages, fall into different economic and social divisions, but know that they represent a distinct religious identity. They may oppose each other politically, or may not even like each other personally due to ideological or ethical or ethnic reasons, but they do not fail to experience a sense of unity with fellow Hindus. They know clearly that the tradition to which they belong is unique in the world, and it is the same tradition which their ancestors practiced for generations. They also feel obligated to continue it for posterity. In essence this is what Hinduism is. It is a living tradition which communicates through the hearts, minds and spirits of its millions of adherents. The word "Hindu" is secular in its origin, but it is now deeply associated with the religious identity of more than a billion people in various parts of the world. The world is also associated with numerous institutions, religious movements and philosophies. Barring a few extreme adherents, Hindus are known for their tolerance towards other faiths and belief systems. In the same Hindu family, you may find people following different paths and worshipping different gods. It is also true that with increased awareness, religious extremism is also on the rise in the Hindu community, while a few believe that Hindus are discriminated and their leaders are disrespected not only abroad but also within India itself. Today if some Hindu groups are becoming increasingly aggressive or defensive about their faith, which is an unfortunate development, it should be viewed as a reaction against those who are intent upon converting Hindus or spreading misinformation about it. Let us hope that it would be a temporary phenomenon.